With a pint of my Awesome Apple Butter of Awesome. I actually put up a batch of jam this week, as part of my "It may be time to make an attempt to reengage with the world" strategy. That won't be offered until next Friday, after it's had a chance to set up. The winner of the Raspberry Jalapeño Jam from back in July is Mrs. Dr. Phil, with a random number of 7. I can attest that this is the yummiest thing on the planet when it comes to jelly. I have a good stock right now, but I would encourage the rest of you to get on the stick. 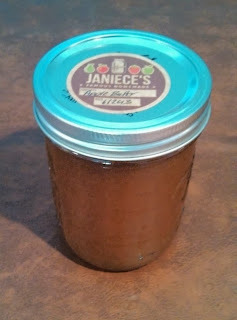 I'd like some Awesome Apple Butter of Awesome. Oh, yes please! Because ... Autumn. And apples. And Awesome. And it's all alliterative. Awwwwww, yeah! Apple butter, oh yes plz. Me! Oh pick me, random number generator! Me! I need it for the new house! Yes! Me! I need it because ... well, I don't need it, I just wants it my precioussssss. I'd put my name in but we just won in July, so will graciously bow out. Dr. Phil, with the summer you guys have had, you can put your name in as many times as you like.